This is one of the new shapes I decided to work with, and I am absolutely in love. ~ Shungite is #1 crystal to help to get rid of harmful emf radiation - it is known for having diamagnetic shielding proprieties (basically this just means it reverses magnetic fields & creates an energy shield). I also added Rose petals that I gathered in one meaningful day for me, that was filled with amazing loving energy. It adds such a loving feel to the Orgone, and anyone who is energy sensitive, may sense it while around it. 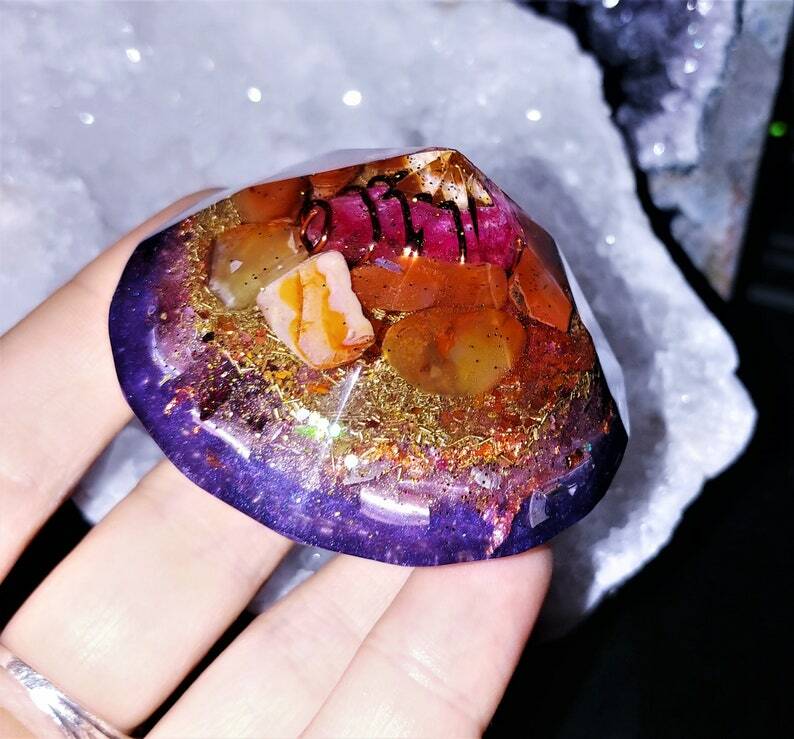 It contains Purple Aura Quartz wrapped in copper wire, Red Calcite, Shungite, Carnelian, Rose Petals, Pyrite sand, Mica Flakes, 24 K gold flakes, Metal shavings, Copper coil, copper beads, Black Sun Iron Oxide nano powder, jewelry grade epoxy resin, Highest intention, 528Hz frequency of Love, Reiki Energy. DISCOUNTED: The back has some resin flows that will not affect the healing energy of this beauty. All the crystals in the orgone device were cleared in ocean water (Florida, Miami), charged in the Sun light. It was treated to vibration of Love and Light ~ 528 hz~ while curing. The Organite is sanded, shaped and polished by hand, giving the surface a glossy, and smooth finish - sanding is a special process that I treat like a ceremony - I am learning about the energy of each Orgone device and enhance it with Love vibration as I polish them. This Orgone Paperweight is 2.5" x 2.5"